I am so over nut bars when I’m out on a trip. Yes, they’re easy, but the only ones that I like are full of sugar and don’t deliver much bang for your buck. 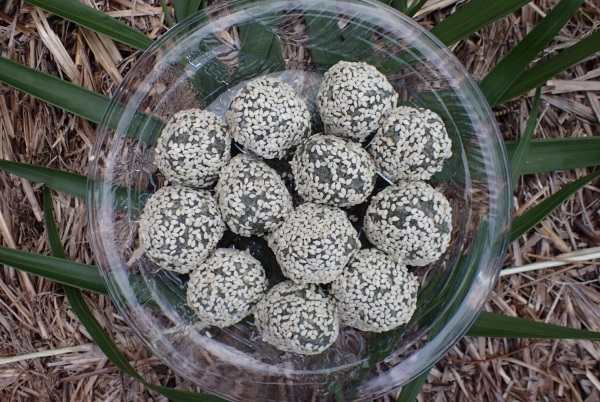 Jenny H visited me a while ago and brought along some Sesame Balls that she’d made, talk about delicious! So, I thought I’d make some up, but also give dehydrating the mix a go (I figured it might be like Italian Biscotti). Well, after 24 hours, the dehydrating was a dismal failure, what was I thinking when it’s basically nuts and tahini, there isn’t any water there to dehydrate! However, I’ve now got a freezer full of tasty balls just waiting to go out on a trip. Place nuts in a food processer and process until evenly chopped. Add other ingredients, except sesame seeds and process until combined. Makes 50 balls. Keep refrigerated (or freeze for up to 3 months). How easy is that! It’s the Spirulina powder that’s the superfood, but, it’s a little costly and now I’ve got enough to last me a lifetime. Apparently it’s been around for ages and some time ago Jeff B tried it in a smoothie and said he’d never try it again, but the nuts seem to overshadow the Spirulina taste. I’ve given some to my Dad to perk him up, he’s of the opinion that the sesame seeds on the outside are a pain (getting into your teeth), so I’ll make some for him sans sesame seeds. Happy to take orders for the balls, just let me know many you want. Do they only come in packs of 50 or can we get them in packs of 10? Seeing you’re my only girl cousin, you could pretty much say anything you wanted!